DOI is an international, public, persistent identifier of intellectual property entities in the form of a combination of numbers and letters. 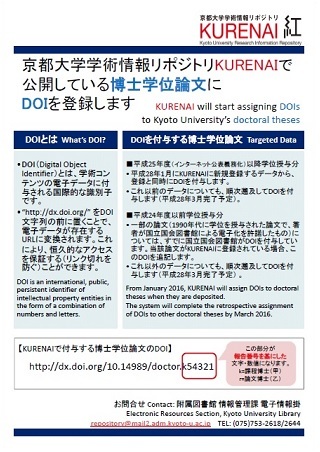 From January 2016, Kyoto University Research Information Repository KURENAI will assign DOIs to doctoral theses when they are deposited. The system will complete the retrospective assignment of DOIs to other doctoral theses by March 2016.